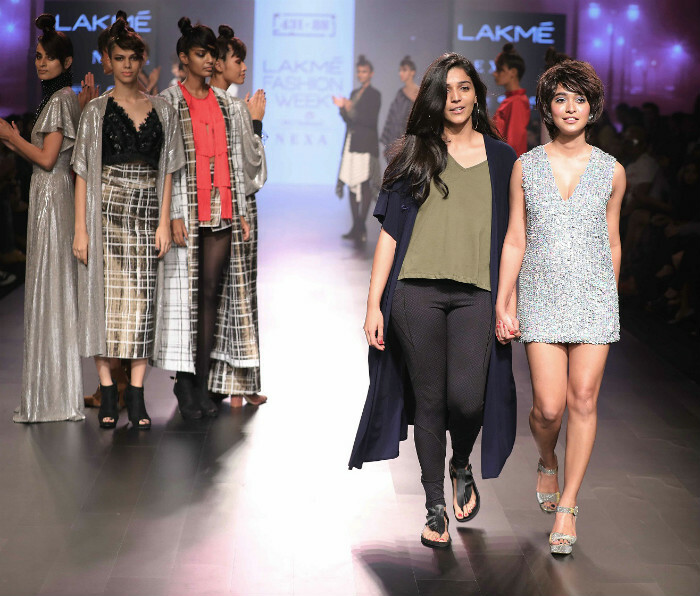 DAY 1 - Lakme Fashion Week – Winter/Festive 2017 - Wedding Affair var admin_url = "https://weddingaffair.co.in/wp-admin/"
Day one saw the unveiling of “Sweet Surrender” by The Label Ritu Kumar and the audience seemed to completely surrender themselves to the brilliance of it all. “Sweet Surrender” is inspired heavily by the French Marquis era of the 18th century which focused on pouf dresses from the waist down with embroidered or printed flower motifs. The line also had elements of the 80’s incorporated seamlessly into the designs which shed light on the bold, skin-baring fashion choices that had emerged in the late 80s. 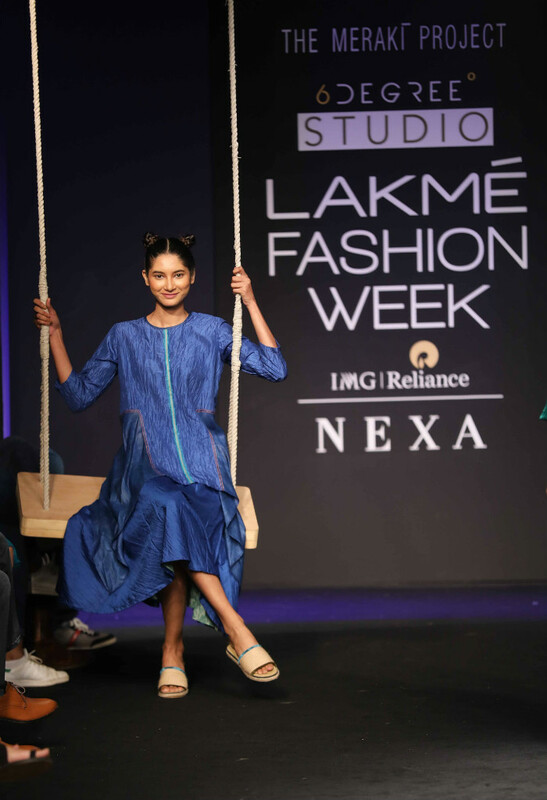 The ramp came alive with soft pastel hues which were given an extra “oomph factor” by tropical prints. A lot of canary yellows and minty melons were thrown into the mix with subdued blues and reds along with a range of asymmetrical cuts. Disha Patani graced the runway as the show-shopper and she looked all sorts of elegant and beautiful while gliding down the runway. Day one also saw a happy-go-lucky runway complete with a swing and a game of hop-scotch. 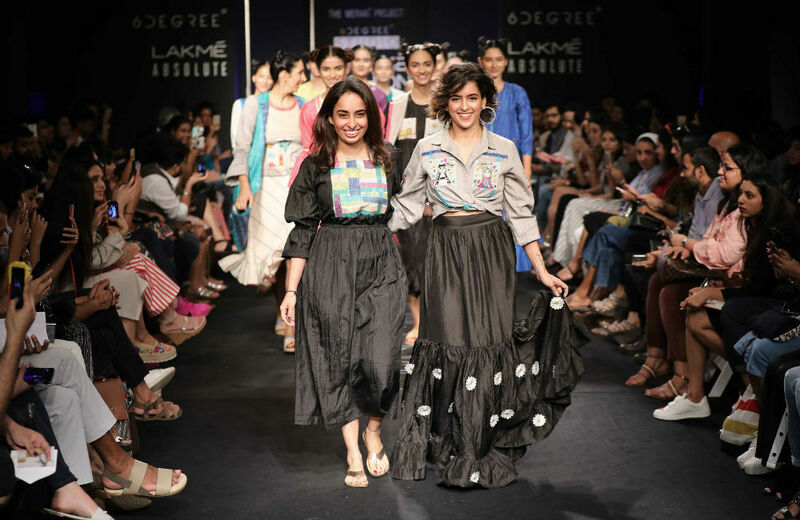 Sonali Pamnani showcased her collection “Little Hearts” for her label ‘The Meraki Project at 6Degree Studio and it was exactly what you would expect it to be – fun, frivolous designs that will bring out the inner child in you. However, the choice of fabric and the way the ensembles were designed with crushed silk and organic cotton give it a mature edge also. Stand out pieces like jumpsuits with wide legs, the long-line waist coat and pieces with frayed patchwork detailing made “Little hearts” a collection that was both wearable and pleasing to look at. A yellow midi dress caught everyone’s attention with its catchy slogan – “Loving Someone is like a lot of Eye-Contact”. Sanya Malhotra who was every bit in character swooped in a peppy, child-like walk and put a smile on everyone’s faces. 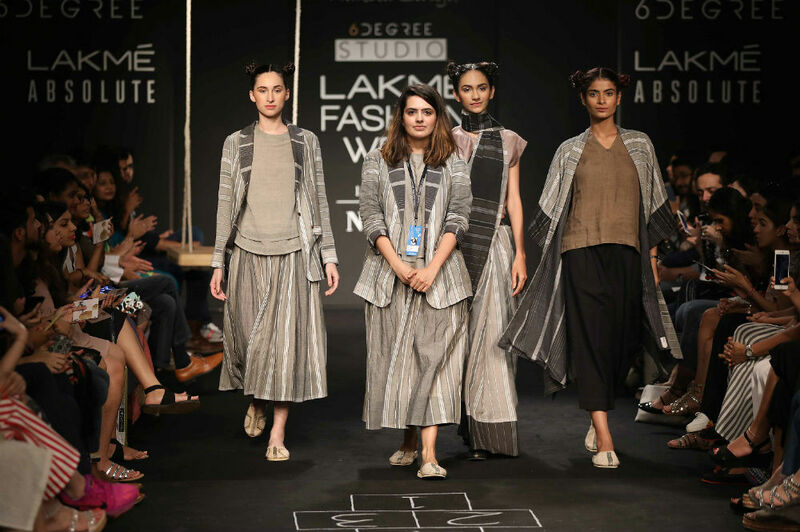 Sonal Verma’s label “Rara Avis” which showcased “Colander” was much talked about and was quite the head-turner at the Lakme Fashion Week WINTER/FESTIVE 2017. “Colander” presented the audience with interesting re-imagined silhouettes. Trench and kimono shapes made recurring appearances while layering was prevalent throughout the whole collection. Colander saw the use of many jewelled tones with fabrics like wool, leather, cotton and fur. Jannat actor Sonal Chauhan played showstopper to Sonal Verma’s collection as she sailed down the runway in a metallic kimono style dress which was accessorized with a leather belt. 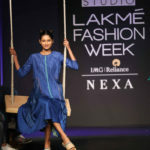 Unconventionality found home in the runway of Lakme Fashion Week for designer Shweta Kapur as she unveiled her collection “Collection NO 10”. 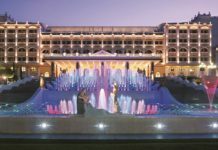 Kapur’s name is a household name when it comes to those who like to dress edgy and go that extra mile in communicating who they are as people through fashion choices. “Collection NO 10” wasn’t any different in its approach as it boasted of interesting patterns and power shoulders which were clenched at the waist. The range was a beautifully complicated series of designs that incorporated mesh, fringes, leather, jacquard, jersey and Swiss cotton making it a sight to behold. 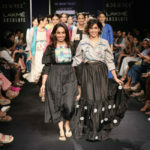 Sayani Gupta not only stopped the show but the hearts of many as she glided down the runway in a sequined mini dress. 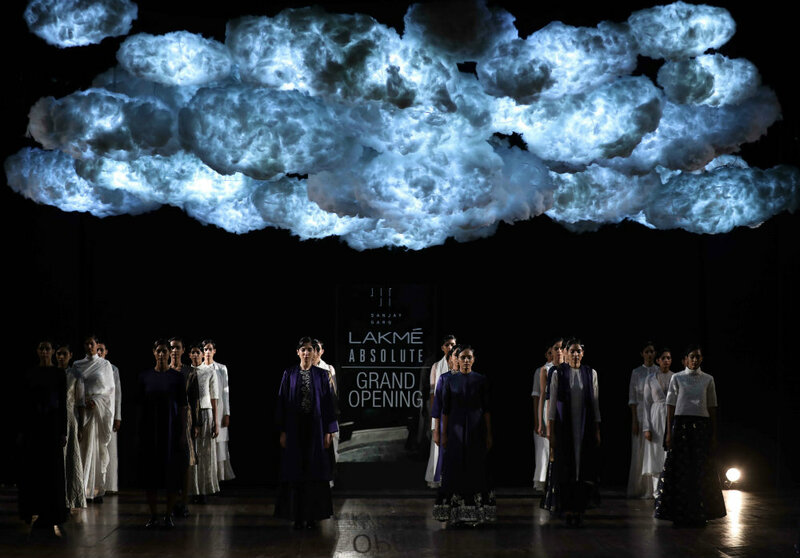 Sanjay Garg concluded the first day of Lakme Fashion Week – Winter/Festive 2017 in all its grandeur at the other-worldly Royal Opera House where he unveiled his collection “Cloud People” which drew inspiration from ‘Liquid Gold’ also commonly known as Argan Oil – an oil that is prime in the making of Lakme products.